We are a family run business with a wealth of knowledge and experience in designing and installing both sliding and hinged doors, along with storage solutions for any room. We offer a bespoke selection of floor to ceiling made to measure sliding systems to suit every budget and maximise space in every home. Each of our fitted systems includes full interiors in a variety of layouts and finishes. 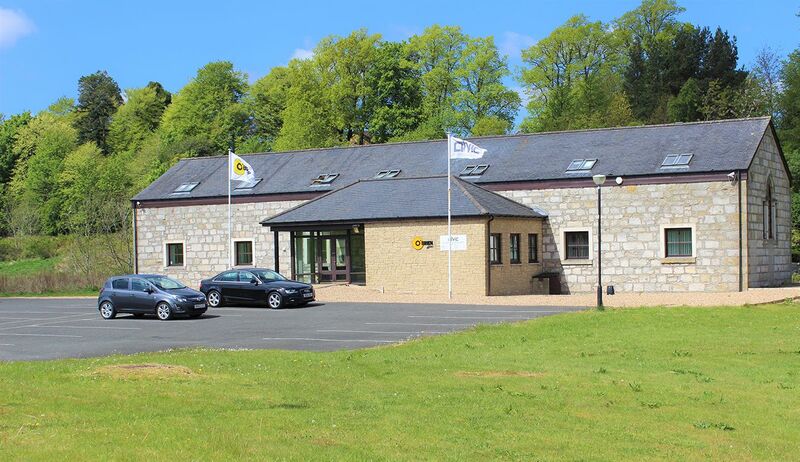 Our showroom is in Houston, Renfrewshire (just off the M8 and 10 minutes from Glasgow Airport) where you are welcome to come and take a look at the variety of Sliding Systems and finishes we can offer along with our featured walk in wardrobe. Have a look around our website to explore our Ranges and to see some examples from our portfolio of installations then give us a call on 01505 614419 to book an appointment. Also check out our 5* reviews on our facebook page. 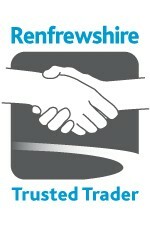 We are proud to be a Renfrewshire Trusted Trader. From the beginning I found Allan to be very pleasant and helpful. He listened carefully to our ideas and requirements, and gave great advice. As a result, our finished wardrobe design was exactly tailored to our particular needs. I would highly recommend this company! Really happy with my finished wardrobes. Just what we were looking for. Brilliant value for money! Perfect! I was really impressed with the quality of the craftsmanship that we received. Also I was very grateful that Allan left the whole area completely spotless when he had completed the installation. An added bonus! Absolutely terrific! We are more than delighted with our sliding wardrobes. We have shown them to all our family and friends and everybody absolutely loves them. We are really happy with our new wardrobes. People are continually commenting on how great they look, and asking where we got them from. Really pleased with our finished wardrobes and also impressed with the fast and efficient service that we received throughout. We placed our order during the very busy pre Christmas period and were extremely pleased that all of our wardrobes were fully fitted before Christmas. I would just like to say what a wonderful job Allan did installing my new wardrobes. My friends and family are constantly commenting on the quality and asking who installed them. Information which I am only too happy to pass on. I would also like to point out how tidy Allan left the whole area. This made a huge difference and was very much appreciated. The Linear is our most versatile range which offers 9 frame colours & over 20 choices of woodgrain to insert. The Pinnacle offers over 20 woodgrain finishes with a sleek aluminium inset handle. The Shaker is a classic design with an oriental feel which comes in 5 different frame choices. The Royale is a traditional styled door available in over 20 wood finishes and is available in 3 different styled doors all with a bevelled frame for a minimalistic look. Introducing Volante. With 4 different frame options and a wide variety of finishes including glass, wood, suede, chalk and chipboard you’ll be spoiled for choice. The New England has become one of our most popular range of sliding doors in recent years with more and more people choosing high gloss for its modern, clean look and its practicality. Our brand new Moderna Range is coming soon, please check back shortly! Every home is unique and so all of our superb storage solutions can be completely customised to suit your own space, style and individual taste. Check out some examples.